Cooke Furniture is proud to announce its latest Fire Pit table at The Four Seasons Lanai. The hotel was completely revamped almost a year ago and no aspect was left unimproved. The construction was part of a $75,000,000 renovation initiative to the grounds according to the Washington Times. One of the most monumental improvements was to the outdoors. Hawaii already provides some of the most beautiful outdoorscapes, and The Four Seasons, Lanai’s attention to detail created something really spectacular. This renovation is one of the biggest improvements to Lanai in many years and so it has been the subject of much fanfare. Cooke Furniture provided the fire pit tables for the outdoor sitting areas. The magnificient tables paired with the outdoor sofas, made an unforgettable lounging experience. Patio dwellers have the ability to nestle in with a drink on the sofas around the dancing flames from the Cooke Furniture fire pit table. They even have the ability to enjoy food around the fire pit tables. A truly magical experience has been created with this combination of food, flame and furniture. We think that one of the greatest improvements that came about from this monumental renovation initiative was the improvement to the ambience of the outdoorscape. This ambience created by the newly created outdoor dwelling area, complete with Cooke Furniture Fire Pit tables, were the key to success. As with all of the implementations of Cooke Furniture fire pit tables, the venues have gone a complete transformation from some form uninvitingness to the epitomy of welcoming, inviting, and extreme comfortability. This is a signature distinction between conventional outdoor furniture and Cooke Furniture fire pit tables. The combination of the utility from the warmth and table function combined, with its luxurious and elegant look make it a magnet for lounging. The fire pit table’s granite top makes it the ideal place to place your beverage or tapas plate. The fire pit media includes lava rocks to lock in the maximum amount of heat to close surrounding perimeter. 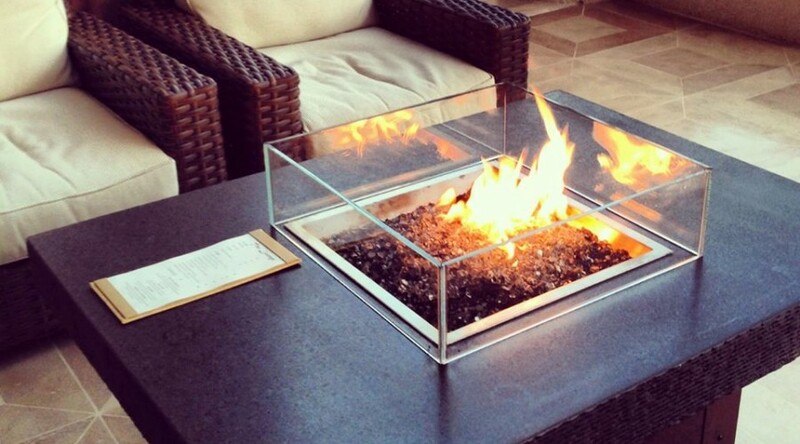 The glass encasing, distributes the flames heat evenly so as to allow close contact to the table. It makes for an idea place to put your feet up while you watch the sun set. Like many of our fire pit tables, the Four Seasons table featured a custom engineered star burner. This table and its flame system were custom designed to have the best flame pattern and heat distribution on the market. If there was ever a problem getting guests to congregate and mingle on your patios before, that problem is easily solved with this best of breed, Cooke Furniture fire pit table. The fire pit table at Four Seasons Lanai was also featured the Go Visit Hawaii website. The article goes on to mention how much of a romantic setting the combination of the fire pit table with the outdoor sofas make. We agree that catching a sunset from the patio around one of these cooke furniture fire pit tables is truly romantic. There is just something about the dance of the flame on one of the fire pit tables at dusk that make a moment that will never be forgotten. All of this, and on one of the smallest most beautiful islands, Lanai. TripAdvisor.com also featured a picture of the fire pit tables. The picture is part of the hotel and grounds album. It shows how the presence of the fire pit table on the grounds accentuates the common dwelling area. The fire pit tables fit perfectly with the outdoorscape but also highlight it. The Four Seasons Lanai at Manele Bay, is arguably one of the most beautiful hotels in the world. This has become an even stronger argument after the massive renovation mentioned above. The hotel boasts over 95,000 feet of stunning shoreline. There are over 400 miles of unpaved road in the area to explore, hike and adventure. There are over 30 different dive sites from which you can plummet into the blue ocean. The resort is only 9 miles away from beautiful Maui, which makes it an ideal escape. There are 0 stoplights which makes The Four Seasons Lanai at Manele Bay just outside of the sit that it feels like a true nature get-away. To top it off, there are 10 Cooke Furniture fire pit tables which lend to the calming and relaxing ambience of the resort. If you haven’t come to the conclusion already, it is an oasis of the truest kind, accented with the Cooke Furniture. When you stop by this stunning resort, let us know what you think of our fire pit tables in the comments.